Cities evolve and so must their transportation systems. The South End highway project—once part of a long abandoned freeway encircling Burlington and subsequently up-dated--still fails to serve the City’s residents. 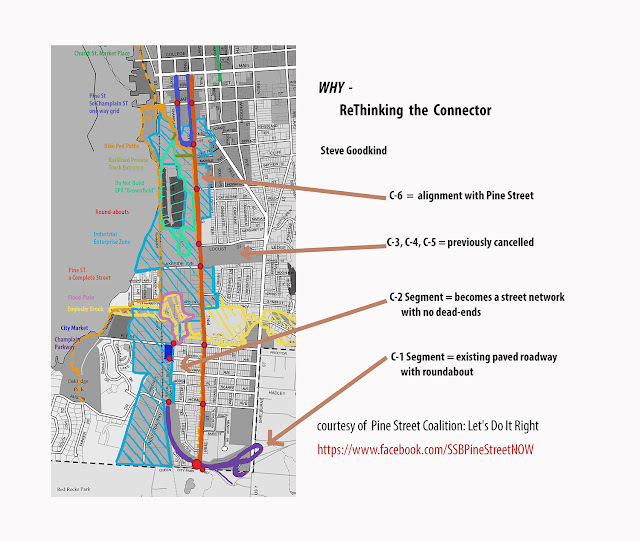 First called the “Southern Connector” and more recently the “Champlain Parkway,” the project requires a reconceptualization to incorporate safety, street connectivity, a reduction in intersection delay, and to support pleasant walk and bike-ability. With these improvements, the corridor can enhance our burgeoning South End Arts District and associated businesses. 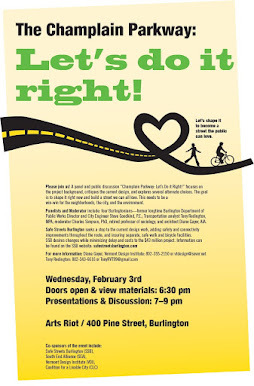 Over the last year, City residents in the Save Streets Burlington Coalition (SSB) have met among themselves and with City officials, eventually formulating the following “Champlain Parkway and Pine Street Corridor Redesign Guidelines” (Guidelines). While specific details will require the work of experts, these principles reflect our collective vision of streets supporting livable communities. When the initial thoroughfare was planned in the 1960s, it incorporated a “speed-the-car” logic. The current Parkway design remains committed to that outdated concept. Worse, the $43 million current Parkway design moves away from both safe street and complete street principles. These better principles are reflected in recent public discussions, Plan BTV Downtown and Plan BTV South End, the North Avenue Corridor Plan, the recent preliminary Railyard studies. the 2014 recommendations of the city's Walk Bike Council, and the City Walk Bike Master Plan now nearing conclusion. The current Parkway plan contravenes each of these studies. In January 2016, SSB issued a White Paper which identified South End road needs as beginning with separate walk and bike facilities, environmental sensitivity along this sensitive lake-front area, and overall livability. It prioritized safety—minimizing highway injuries and fatalities—and called for roundabouts rather than signaled intersections. These briefer “Champlain Parkway and Pine Street Corridor Redesign Guidelines” do not attempt a detailed prescription but set a starting point and identify essential planning principles to guide any final design. Robust public discussion must be a component as the design phase continues to address integration of mass transit along the Pine Street corridor, traffic facilitation on the Pine/King and Pine/Maple intersections, and preservation of existing businesses and rail activity. Design Guideline: Bottom of Pine Street to Flynn Avenue The present Parkway design reduces the roadway to one lane in each direction with a median on the section west of Shelburne Road. While this works, there’s a flaw. What’s needed at Pine Street is an intersection that avoids barricading off this important north/south corridor from points south so access to Queen City Park Road and the Kmart lot and other area businesses is maintained. The abandoned Kmart Plaza is a natural site for an intercept park-and-ride facility to shuttle workers to and from Burlington employers including the Hill institutions. Within the project’s 25 year lifetime, it is likely a New North End to Kmart Plaza light rail line will be built to connect North Avenue, the Marketplace, then follow Pine Street through Kmart Plaza and beyond. From the Pine Street interchange, a simple two-lane street with a median should continue to the Home Avenue intersection. From Home Avenue to Flynn Avenue, the Parkway becomes a local street conforming to the “complete street” design which includes separate bike and walking paths along the present routes of Bachelor and Briggs streets, with full connectivity to Morse Place, Lyman Street and Ferguson Avenue. This scraps the present design which would walled off these streets with a limited-access Parkway. The SSB plan enables full access to City Market planned at Flynn. That intersection, as well as the Pine/Parkway exchange, must be efficiently supported by roundabouts. Using Bachelor and Briggs will save a considerable amount of money and free up land, as contrasted with the present Parkway plan. Design Guideline: Safe, Separate Bicycle Routes and Walkways The SSB design principles accommodate a seasonal multi-use path along the Parkway from Shelburne Road to Pine Street. At that point separate walk and bike paths would take users through to Curtis Lumber, either via Pine or via Bachelor and Briggs. At Curtis Lumber, a proposed new road following the defunct rail spur would connect Pine to South Champlain Street and the walk and bike paths would follow this route—connecting to the Burlington Bikepath via the Battery Street/Maple Street intersetion. All season lighting and plowing would be provided, maintaining these as safe alternatives to single occupancy automobile use. Design Guideline: Pine Street from Lakeside Avenue to Main Street Cycle track along Pine Street in this portion would be facilitated by re-alignment of Pine between Howard Street and the old Public Works facility, narrowing by about six feet the western green strip and creating space to widen the sidewalk and add a green strip on the east side of Pine Street facilitating the attractiveness of businesses there. A separate two-way bikeway from Pine and Lakeside to Curtis Lumber using the rail spur and separate sidewalk can easily be installed. Design Guideline: Pine Street from Lakeside Avenue to Main Street Money saved by down-sizing the Home/Flynn segment and eliminating the Flynn/Lakeside component is now available to improve Pine Street from Lakeside Avenue south to the I-189 interchange. Pedestrian improvements like the Pine Street-Home Avenue roundabout contained in a Walk Bike Master plan draft, recommendations from the AARP Dan Burden Pine Street workshop, and bike lanes can be considered. The narrowness of Pine Street south of Lakeside Avenue may constrain choices for bicycle accommodation on lower Pine Street.